Would God floss? Do spiders sing? Can you see the Universe in your reflection? 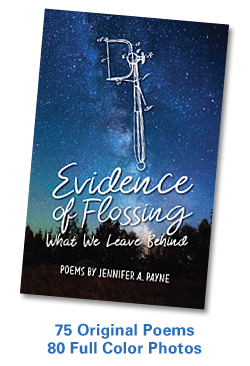 Part social commentary, part lament, the poems in Evidence of Flossing: What We Leave Behind are, at their heart, love poems to the something greater within all of us. Inspired by Henry David Thoreau, John Muir, and Mary Oliver, naturalist Jennifer Payne explores the essence of spiritual ecology: the human condition juxtaposed to the natural world and the possibility of divine connection. 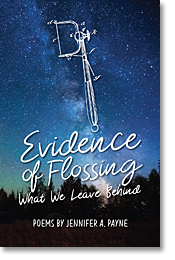 Its pages are illustrated by an absurd and heartbreaking assortment of original and vintage color photographs, including a series of discarded dental flossers that prompted the title of the book.